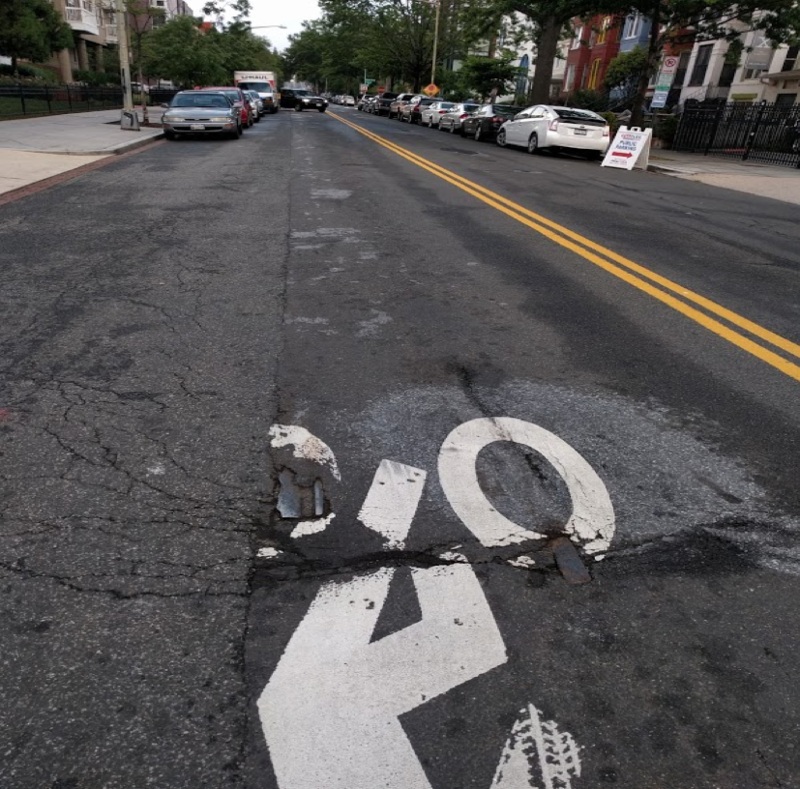 If you travel frequently on 11th Street NW through Shaw and Columbia Heights, you might have noticed that the road’s asphalt is deteriorating in an interesting pattern. That’s because a relic of DC’s bygone transit system — old streetcar tracks — are buried just underneath the road’s surface. Those remaining tracks are causing the street to crack and crumble far faster than it should. Geoff Hatchard wrote about “Zombie Rails” like this back in 2010, and it’s clear that the problem hasn’t gone away. The uneven base under the pavement of 11th Street here means that the dead rails are constantly trying to claw their way back to the surface. Some spots simply have two parallel hairline cracks, while in others, the rails have caused serious damage to the road. In more and more places, you can see the entirety of the rail. This is starting to become an issue between T Street and Florida Avenue, a gap in a popular north-south bicycle route where bike lanes disappear into sharrows. During morning and evening rush, you’ll often find a throng of 6-10 cyclists having to maneuver around not only cars and buses, but also areas of pavement so damaged they're impossible to bike over. These rails are leftover from the 60 route, which was decommissioned in 1961. However, these tracks aren’t the only present-day reminder of the old streetcar. The aptly named “Trolley Turnaround Park” at 11th and Monroe Streets reused the end-of-the-line loop as a public space and playground. Similarly, Lamont Park in Mount Pleasant was built in the old turnaround track for the 42 line. What do we do with zombie rails? This is a long term issue in road maintenance on 11th street and elsewhere. 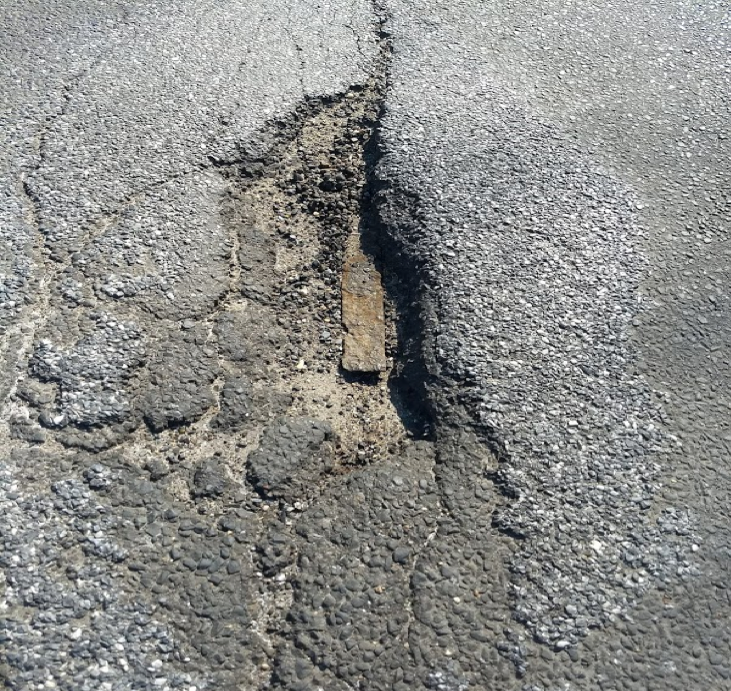 In the long run, streets that still have rails buried underneath them will have to be repaved more frequently, not to mention the higher “pothole tax” cost drivers and cyclists pay in repairs. A provision buried in the DC Code from the 1940s indicates that the Capital Transit Company (the private company which ran the old streetcars) was to be financially responsible for the removal of rails when a line was shut down. It's clear that didn't happen everywhere. Not too far away on 14th Street, tracks were recently removed as part of a comprehensive streetscape improvement, while on O and P Streets in Georgetown, tracks were preserved with cobblestone streets. 11th is a significant arterial, so it probably doesn’t make sense to preserve the tracks in the same way. This certainly isn't the only place where tracks weren't properly removed or preserved. Should there be a more serious plan to deal with these zombie rails, or will DC will keep letting the ghosts of its old streetcars continue to resurrect themselves?